15day adventure tour in Vietnam's activites: Cruising, kayaking, mountain climbing, sampan rowing, cave exploring, biking, trekking, homestay and culture discovery. Being picked up at Noibai airport by the tour guide of Deluxe Vietnam Tours, you will be transfered to Hanoi for check-in, recovery and overnight. New and exciting discovery for the first time all over again in Maichau - a charming valley surrounded by green rice fields and beautiful limestone mountain cliffs. the White Thai and Muong enthic groups make the valley more charming with little stilt houses. Explore Maichau's charm with trekking route: Poomcon - Vanmai - Samkhoe with treking up and down the hills and from one village to another. Discover the culture and lifestyle of the local ethnic people with visits to their home, talks with local people. You will be loved with their friendliness - one of top highlights for your adventure tour in Vietnam. Join sampan rowed by local people to explore stunning Ngo Dong river along the rice fields and limestone mountains where the famous movie "Indochine" was filmed. It is a great trip with wonderful photos for professional photographers. New discovery will be gained by biking on small, peacefull countryside trails from one village to another. Discover the up and down history of Vietnam in 10th century with a visit to Dinh temple and Le temple and the foundation of the capital. Visit Bai Dinh pagoda to see the art of stone scupturing of 500 stone buddhas. Overnight in Ninhbinh. 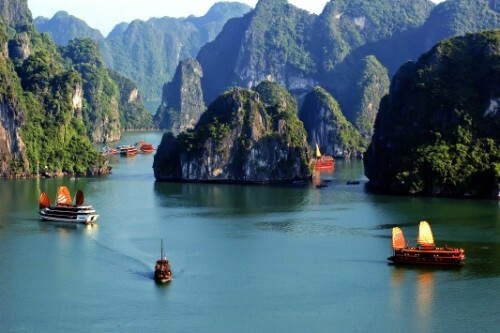 Explore stunning Halong bay - UNESCO heritage site and is considered as the "Paradise on Earth". Best of Halong bay tours is getting off the beaten track on the second day with cruising through thousands of unbelievable shaped limestone islands to isolated floating village of local fishermen - This section of The majestic section is also the place where Jame Bond - "Tomorrow will never die" was filmed. Halong bay trip also create forever impression with kayaking, mountain climbing, sampan rowing, cave exploring.